Clash Royale might only be about a year and a half old, but developer Supercell has done plenty to help keep it relevant in a constantly-evolving mobile game market. Among the newest changes to the Clash Royale formula is a new update that includes several new events as well as one new gameplay mode. Called Touchdown, this new gameplay mode pits two teams of four players against one another with the overt goal of getting troops into the opposing team's end zone in order to score a touchdown and gain the crown. To learn more abouw how the Touchdown gameplay mode works, check out the Supercell's Touchdown Tournament featured below. 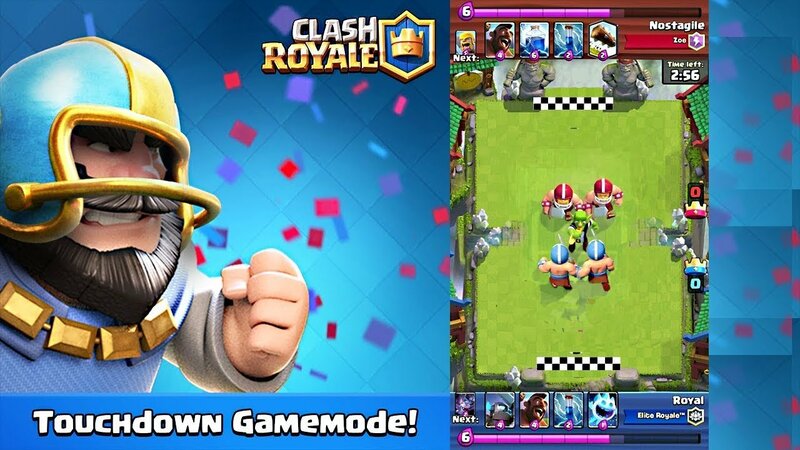 There's more than just a new gameplay mode in the update as well: Supercell has finally added a feature that allows players to chat with one another as well as start rematches using previous 2v2 teammates. Players will also now be able to copy and share their favorite decks, new and better daily deals will be appearing in the in-game shop, and players can now collect a free Epic Card every Sunday. Naturally, and as has been the case with several past updates to the game, the latest Clash Royale undate includes several new card balances that affect Tesla, Sparky, Electro Wizard, and others. For a full list of the changes Supercell has made with regard to balancing, head over to the latest patch's notes over on the official Clash Royale website. Load your favorite tablet or smartphone up with some of the exciting freebie titles we've featured on our list of the Best Free To Play Games.